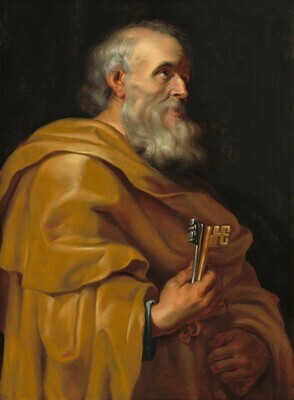 Saint Peter, portrayed here in half-length as a slightly balding, full-bearded patriarch, stands grasping the keys of heaven. With his deep-set eyes gazing upward to the spiritual realm, he projects the commanding authority of the apostle whom Jesus identified as the rock upon which he would build his Church and the man to whom he would entrust with the kingdom of heaven. Draped in an ocher-colored robe, his body feels strong and powerful, a reminder of his life as fisherman before joining Jesus's disciples. Images of the twelve apostles were popular during the Catholic Counter Reformation, particularly in the wake of the Council of Trent (1565), which emphasized the great importance of saints as intercessors for the faithful. Series depicting the twelve apostles proliferated at that time, the most impressive of which was the one Peter Paul Rubens produced in the early 1610s for the Duke of Lerma, the powerful minister to King Philip III of Spain (now in the Prado). Paintings from this series served as prototypes for other depictions of apostles stemming from Rubens's studio in the 1610s. Such was the case for this depiction of Saint Peter, which derives from the figure of Saint Philip in the Lerma Series. The poses of the two apostles are identical, with only their attributes differing—Saint Philip's large wooden having been replaced by the keys of heaven. Whether the Gallery's painting was once part of a now lost series, one of a pair of apostles (presumably with Saint Peter), or a singular work, is unknown. Eugen Boross, Larchmont, New York, by 1914; William R. Timken [1866-1949], New York, by 1936; by inheritance to his widow, Lillian Guyer Timken [1881-1959], New York; bequest 1960 to NGA. In an unidentified dealer's prospectus given to the Timkens (in NGA curatorial files), the earlier provenance of the painting is given as follows: from the collection of Cardinal Joseph Fesch, Archbishop of Lyons, France (1763-1839), afterwards in that of Leopold II, King of the Belgians (1835-1909), who bequeathed it to the Countess Vaughan. The 1841 catalogue of Cardinal Fesch's collection (Catalogue des Tableaux Composant la Galerie de feu son eminence le Cardinal Fesch, Rome, 1841) includes, as number 1195, 'Tête de saint Pierre, de grandeur naturelle; le ton en est fort et d'une grande vérité, hauteur: 1 pieds, 6 pouces, largeur: 1 pieds, 2 pouces." These dimensions, however, do not coincide with the Gallery's painting. The connection to Leopold II and Countess Vaughan seems dubious. An Exhibition of Sixty Paintings and Some Drawings by Peter Paul Rubens, Detroit Institute of Arts, 1936, no. 15, as by Rubens. Valentiner, Wilhelm R. The Art of the Low Countries. Translated by Mrs. Schuyler van Rensselaer. Garden City and New York, 1914: 235, no. 1, as by Rubens. Valentiner, Wilhelm R. "The Art and Personality of Rubens in a Great Loan Exhibition of Sixty Paintings at Detroit." Art News 35 (15 February 1936): 6, no 15, repro., as by Rubens. Valentiner, Wilhelm R. "Rubens' Paintings in America." The Art Quarterly IX, no. 2 (Spring 1946): 156, as by Rubens' Workshop. Goris, Jan-Albert, and Julius S. Held. Rubens in America. New York, 1947: 36, no. 66, as by Rubens..
Summary Catalogue of European Paintings and Sculpture. National Gallery of Art, Washington, 1965: 119, as School of Rubens. European Paintings and Sculpture, Illustrations. National Gallery of Art, Washington, 1968: 106, repro., as School of Rubens. Vlieghe, Hans. Saints. 2 vols. Series: Corpus Rubenianum Ludwig Burchard Part VIII, London and New York, 1972: I: 42, under no. 11, as a copy after Rubens. European Paintings: An Illustrated Summary Catalogue. National Gallery of Art, Washington, 1975: 316, repro., as School of Rubens. European Paintings: An Illustrated Catalogue. National Gallery of Art, Washington, 1985: 363, repro. Wheelock, Arthur K., Jr. Flemish Paintings of the Seventeenth Century. The Collections of the National Gallery of Art Systematic Catalogue. Washington, D.C., 2005: 210-214, color repro.